Stitching on 14-mono canvas does not have to be boring! 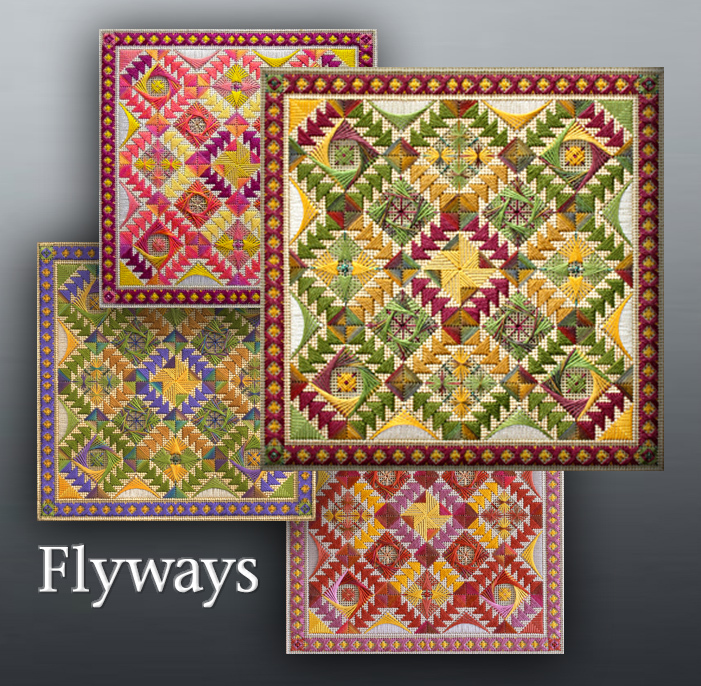 FLYWAYS is a 2-day intermediate level counted canvas design worked on brown 14-mono canvas. It is a quilt-inspired design which combines traditional design and stitch elements with more modern stitch elements. The finished design size is 9 inches square. The working canvas is 15 inches square. This design features an assortment of threads: Gloriana stranded silk, Planet Earth Fibers single ply and 6 ply silks, Princess Perle, Rachel, Grandeur and Kreinik Braids. Stitches used in the design include: Milanese, tent, diagonal Walneto, plaited rays, multiple cross, eyelet, diamond Jessica, upright Gobelin, waffle, Sprats Head, crescents, rice, double cross, and double fan.